This year we really made an effort to have great gf/v options. Last year we ate cheese and wheat but this year we really wanted to stick to our guns and we were pretty successful at each meal. We cooked Christmas Eve dinner so one of the lasagnas was gf/v (I was the only one who ended up liking it) and I made amazing roast veg. We had "sausage" and peppers that my mom made specifically for the vegans and a salad. Add the herbs to the olive oil so it sits for an hour or so. 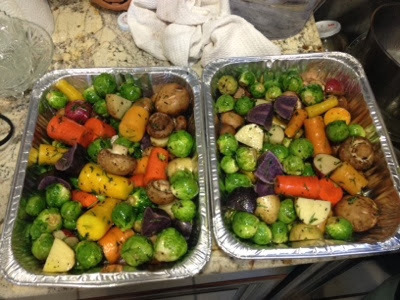 Chop the veggies to smaller manageable sizes then toss with the olive oil and herbs. Put in a pan then in the oven for an hour stiring occasionally. I didn't want the veggies to be soft and mushy so I took them out while they were still sturdy but cooked. I don't have the info for the lasagna but we made bechamel sauce with rice flour and soy milk. My uncle (an amazing chef) made the vegan "meat" sauce and we used sturdy brown rice noodles. Daiya cheese and vegan Parmesan for the cheese layers. For Christmas Day, my aunt and uncle made a huge amazing spread of food full of veggies. 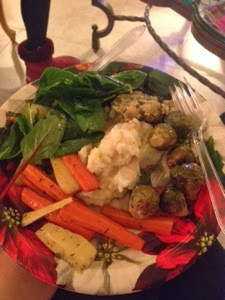 We had Brussels sprouts, carrots and other root veggies, mashed potatoes, and salad. I had a little bit of stuffing because my aunt made it vegan just for me (it wasn't gf that's why I only had a little). I hope everyone had a Happy Merry Christmas (as one of the kids I work with says) or Happy Holidays for those who don't celebrate Christmas.